The former narrow-gauge railway line (width 760 mm) between Trieste and Porec, which operated between 1902 and 1935, was named after the word Parenzo - Italian naming the city of Porec. In Slovenia it is also known as Porečanka. 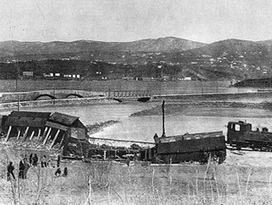 Railway was main hinterland connection with seaside resorts and so the major contributor to the economic development of Istria. 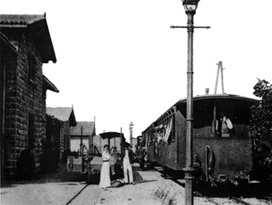 Parenzana was 123.1 km long narrow-gauge railroad, connecting 33 Istrian towns from Trieste to Poreč. Today it leads through the territory of three countries: Italy, 13 km, 32 km Slovenia and Croatia, 78 km. Wagons were 8.5 m long. Passenger had 30 seats which may have been illuminated with the kerosene lights and had balconies, but there were no toilet facilities. They used cargo (both open and closed) and passengers wagons. 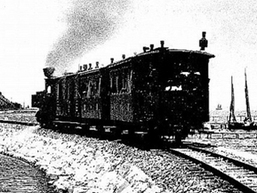 Shortly before the withdrawal of the railway, there was total of 180 wagons in service. Stations were built of materials that were typical for the region in which they were placed (wood, stone, brick). They were built according to the rules of the Austro-Hungarian State Railways. They had to be aesthetic and functional. Its size was depending on the importance and size of the place where they were placed. The first category had more apartments for railways employees, a waiting room and two toilets for passengers. In this category were Koper, Lucija and Poreč. The second category had only one apartment for the Chief of the station. Instead of waiting room it only had vestibule. Around the station it was often garden with ornamental plants, which have contributed to the pleasant and attractive appearance of the building. Some stations are still very well preserved and inhabited, because of their specific appearance you can not miss them when cycling. 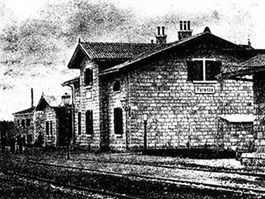 Railway started to operate on 1st of April 1902 when the first train went from Buje towards Trieste and the same year in December it also began to drive to the Poreč. The railway meant life for countryside villages, as it was driving every day through hilly karst relief of Istria, in order to carry passengers, salt from Piran and Sečovlje, olive oil, fruits, vegetables, Istrian stone, lime, wood, flour and wine. After the end of 1st World War, when the region was incorporated into Italy, the latter also took over the management of the line. Company headquarters was moved from Vienna to Pula. Italy gave new locomotives as well as the most of a staff. About a decade the railway have operate profitably. After that, because of the outbreak of the crisis and the the fact, that the maritime and bus services were more competitive, it started being a loss, so Rome gave order for railway closure. Because of the many twists and climbs the average travel speed was only 25 km / h, so the whole journey between Trieste and Poreč together with all the stops took about 7 hours. Slow driving enabled travelers to jump off the train and ripped off some fruit from orchards along the route or went pee (in wagons there was no toilet). The slowness of the train was also a chance for many "stowaways", who could not afford not exactly cheap tickets and this way they managed to evade controls. On the steepest sections the locomotive sometimes lost required power, so the passengers had to get off and push a train. Sometimes mischievous kids greased the rails with figs. Sugar has stopped the train and the continuation of the journey was possible only after they have cleaned. Since the completion of the course it was officially appointed Poreč track or Parenzaner and Istrian railway or TPC (Trieste - Parenzo - Canfanaro) after that. According to the plans it should be built to Kanfanar, but this part was never made. The locals have call it Istranka or Istrijanka or vineyard railway. When Istria was incorporated into Italy it was officially renamed into La Parenzana (Parenzo - the Italian name for Poreč), but locals did not want to accept that name. It was accepted only later, after the World War 2, when the line was already gone. The Croatians have simply named it Porečanka. The revitalization of railway in "Route of health and friendship"
Railway was closed in 1935, but despite only 33 years of operation it has left an indelible mark in the whole area. 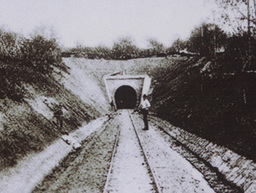 On the hundredth anniversary of the opening the unique initiative was given, to restore railway which, in the beginning of the 20th century, again connected people and nations.